Suggested uses include: Log Cabins, Garden Offices & Studios, Sport Pavilions, Static Caravans, SIPS Buildings and Timber Frame Buildings. 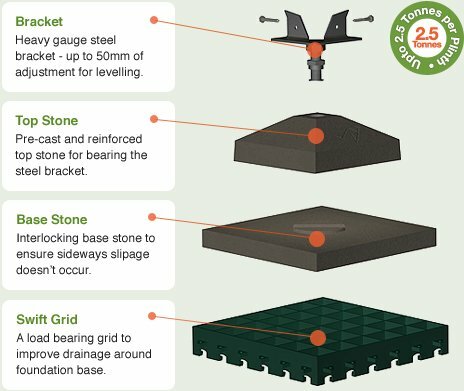 Swift Foundations are here to help with your project. Let us point you in the right direction. Choose a bracket to suit your job. To see our complete range of brackets, download the brackets brochure (Acrobat PDF). Watch our installation video and see how much easier it is to build with the Swift Plinth.